“When I came to you, brethren, I did not come proclaiming to you the testimony of God in lofty words or wisdom. 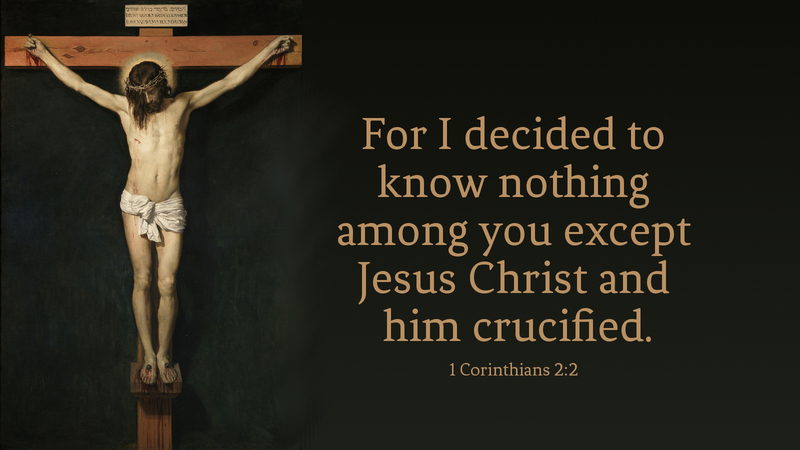 For I decided to know nothing among you except Jesus Christ and Him crucified. And I was with you in weakness and in much fear and trembling … that your faith might not rest in the wisdom of men, but in the power of God” (1 Cor 2:2). Most of us are not strong in the faith or assured in our ability to proclaim the Gospel or witness to Jesus Christ. We might wish it were different, but it’s not. Most of us are frail, uncertain human beings who, with St. Paul, experience weakness and much fear and trembling. It’s no wonder, then, that we fail to share the good news with others, fail to tell others about the saving death and resurrection of Jesus Christ, fail even to invite others to come to Sunday worship where they can hear the Word of God proclaimed and receive Christ’s presence in the Lord’s Supper. We feel altogether unprepared, unworthy and ill-equipped to do such things. And in this, aren’t we very much like Paul? We tend to think of Paul as always self-assured and confident. Many describe Paul as arrogant, so that we can’t imagine him ever being hesitant or afraid to speak up. And yet, Paul himself says, when he came to Corinth, “I did not come to you proclaiming … in lofty words or wisdom … but I was with you in weakness and much fear and trembling….” And far from being a hindrance, this put the focus not on Paul, but in the power of God! Just as Jesus Christ was strongest when He was weak, overcoming sin, death and the devil as He was nailed to a cross, dying—so also we can serve God most faithfully when we are not trying to use lofty words or wisdom but, in fear and trembling, “knowing nothing but Jesus Christ and Him crucified.” To share the good news that God loves us in Jesus Christ, we need not be Bible scholars, seminary professors or ordained pastors—we need only to know Jesus Christ and Him crucified. Prayer: Lord our God, use us in our weakness, fear and trembling, that we may proclaim not ourselves, but Jesus Christ, and Him crucified; through the same, Jesus Christ our Lord. Amen.